Georgia May Jagger. 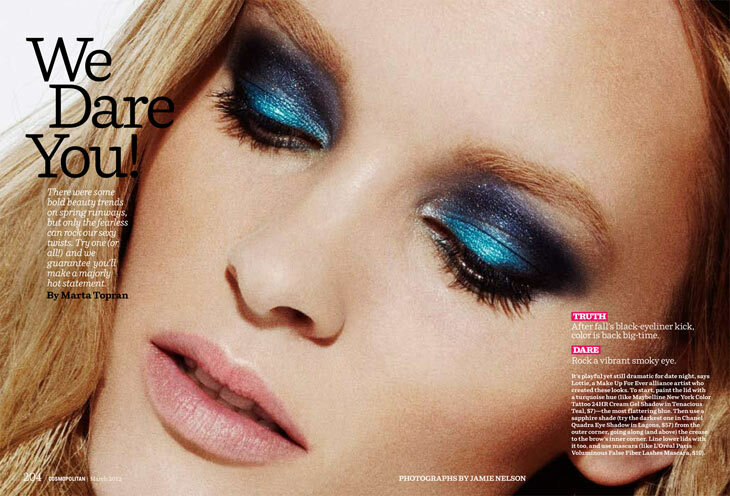 Harper’s Bazaar UK March 2012. Gilded Youth – Georgia May Jagger wears the spring trend of metallic fabrics for the March cover shoot of Harper’s Bazaar UK. Captured by Alexi Lubomirski with styling by Vanessa Coyle, Georgia May wows in glittering ensembles from labels such as Givenchy, Herve Leger and Salvatore Ferragamo. Lush curls by hair stylist Tomohiro Ohashi and bronzed skin by makeup artist Tyron Machhausen complete the goddess ensembles. Pernilla Fransander. Cosmopolitan March 2012. We Dare You – Pernilla Fransander plays truth and dare with spring beauty trends in Jamie Nelson’s radiant images featured in the March edition of Cosmpolitan. From crimped hair to metallic brows, Pernilla takes a walk on the wild side with hair and makeup by Ryan Taniguchi and Lottie. / Hair color by Joseph Mullen, Manicure by Michina Koide. Patrizia Pepe. Spring 2012 Campaign by Mert & Marcus. A Taste of Summer – Edita Vilkeviciute returns as the face of Patrizia Pepe’s spring 2012 campaign, lensed by Mert & Marcus. Wearing this season’s Mediterranean inspired creations of fringe, light fabrics and jewel tones, Edita soaks up the sun in an elaborate setting.